Magliner products are available through the company’s authorized dealer network, which includes S.W. Betz. Magliner is a manufacturer of aluminum and magnesium hand trucks based out of Standish, Michigan. The company was founded in 1947 with a pretty revolutionary idea at the time – to “make things out of magnesium.” More than 65 years later, we think they hit the nail on the head. Magliner hand trucks caught on rapidly, and for good reason. Just like the first hand truck built in 1947, each new product is designed to be durable and enhance workplace safety. 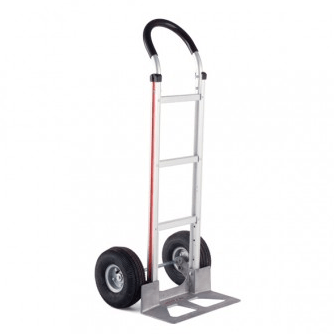 So, it should come as no surprise that Magliner hand trucks are regarded as some of the best in the industry. Lightweight and Easy to Maneuver: Each hand truck can carry up to 500 pounds while most weigh less than 25 pounds. Durable Construction: Magliner products include a number of features designed to increase durability. These include high-quality plating that resists rust, strong aluminum alloy in extruded aluminum noses and brackets, temperature- and impact-resistant magnesium components, and customized hardware. Wheels Designed to Last: Magliner hand trucks feature full pneumatic 10” tires and a proprietary sealed bearing with lifetime lubrication to provide lifelong, easy rolling. Fits Like a Glove: All two-wheel hand trucks feature an ergonomically designed hand grip for a smoother more comfortable gripping surface. Founded in 1933, the S. W. Betz Company, Inc. is one of the area’s oldest distributors of quality warehouse equipment. We are an official distributor for some of the top manufacturers in the materials handling industry, including Wesco Manufacturing, Morse Manufacturing, Presto Lifts, Quantum Storage Solutions, Husky Rack & Wire, Jamco, and, of course, Magliner. We have most standard hand trucks and hand truck parts in stock and can order anything we do not have in our warehouse. We strive to have the best hand truck prices in the area, and we fulfill orders quickly for our customers’ convenience. If you have any questions about Magliner products, please contact S.W. Betz by calling 410-574-1414 or 800-332-0322 today! We are a family-owned business which continues to offer its customers personalized, reliable solutions for all of their materials handling and storage needs. You can count on us! This entry was posted on Tuesday, September 29th, 2015 at 6:12 pm. Both comments and pings are currently closed.